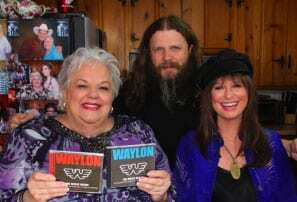 On Saturday, January 7, Jessi Colter and Jamey Johnson will appear on CMT’s Southern Fried Flicks with Hazel Smith to discuss the upcoming release of The Music Inside: A Collaboration Dedicated to Waylon Jennings, Volume II. As usual, the chat will accompany a home-cooked meal and a movie showing, which will be the original 1984 Footloose. The second installment of the Waylon tribute, a project overseen by Jennings’ widow Colter, will be released by Average Joe’s Entertainment and according to Waylon’s website, is available January 24. Featured performers include Dierks Bentley (“Lonesome, Onry, and Mean”), Montgomery Gentry (“Good Old Boys”), Jewel (“Dreaming My Dreams With You”) and more. The first volume of the series was released early in 2011 via the Big Machine Label Group, and a third volume is also in the works. The video for Lauren Alaina’s new single “Georgia Peaches, will premiere exclusively on CMT Friday, January 6 at 8 AM/ET. To accompany the video, CMT is debuting at 15-minute special CMT Premieres: Lauren Alaina – Georgia Peaches with behind-the-scenes footage, interviews and more. The clip was directed by David McClister and filmed at Nashville’s Sylvan Park Melrose Restaurant. “Making the ‘Georgia Peaches’ video was a blast. I got to have some of my closest friends in the video. We were laughing and having a good time throughout the night. I love that I was able to have them there,” said Alaina. Singer/songwriter Deborah Allen will give a lucky fan the chance to attend Elvis Week 2012 (scheduled for Aug. 10-18 in Memphis) with the launch of her Amazing Graceland Contest. The contest opens on Elvis’ birthday, January 8, and closes April 7. One winner and guest will receive round trip airfare to Memphis, hotel accommodations for three nights, admission to select Elvis Week events (Aug 15-17 only), an autographed copy of Allen’s album Hear Me Now, and a special meet and greet with Allen. The Memphis native wrote her song “Amazing Graceland” after visiting Elvis’ home, and it appears on Hear Me Now. More info here.